Around the edges - our research has taken on greater binary implications with respect to future risk appetites in the markets. What we mean by that statement, is there are several bearish scenarios that should they trigger, would change the tone of the market rather quickly. On the flip-side, if they come to pass - we would expect a rejuvenation and continuation of trend. 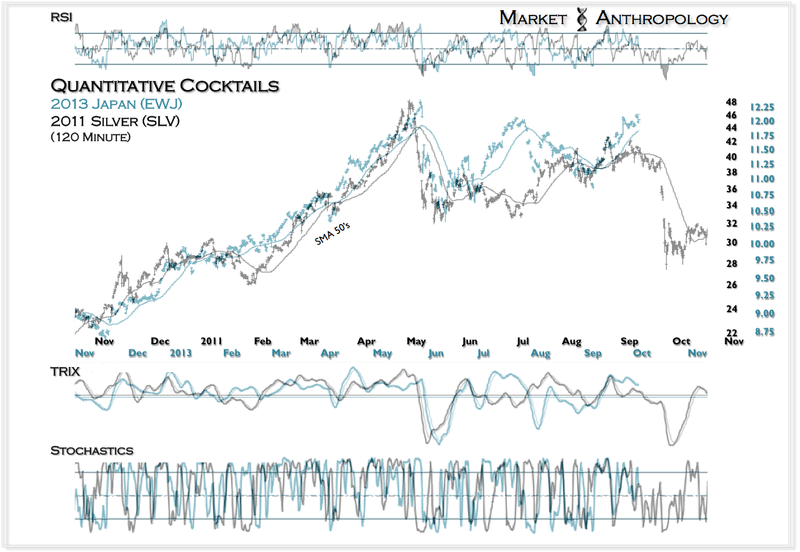 Considering it's been over three months since we revisited a concept introduced here in June, we thought we'd put together an update of our Quantitative Cocktails (see Here) charts that looked at Japan and the Nikkei. 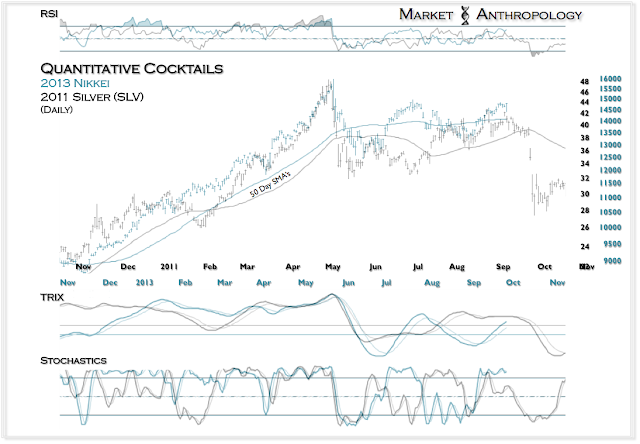 "It's safe to say that both silver and the Nikkei were THE risk cocktails for each periods pronounced gains; whereas, the markets monetary handlers had brought participants noses back to the trough to feed (through a perceived weakened currency) - then gallop, in the asset meadows that would most benefit its yield. As was the case in 2011 with silver and the commodity led risk drive, the impetus for these pronounced periods of boom and bust were largely psychologically driven phenomenons, motivated by what initially was perceived as radical central bank interventions. Should the rally in the Nikkei meet the same fate as silver, the weakness in the targeted currency will prove to be ephemeral as well as its primary benefactors." Although the reflexive bounce in the Nikkei was marginally stronger than the comp alluded to this June, the negative strength and momentum divergences are apparent. 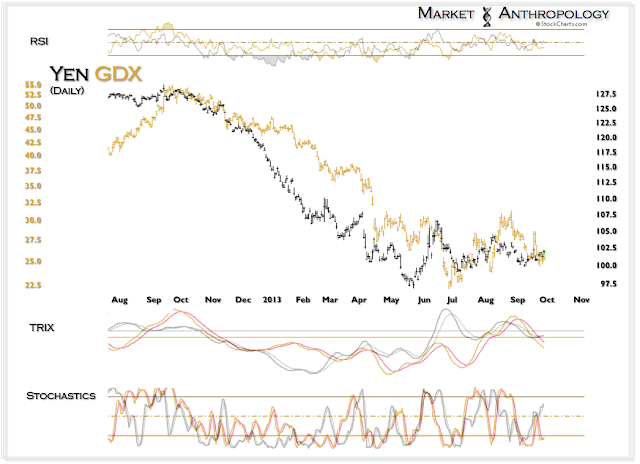 Either way, the market should tip its hand over the short-term. Should the comparative continue, the pronounced positive divergences in the yen will likely find a match - as well as a mean reversion.